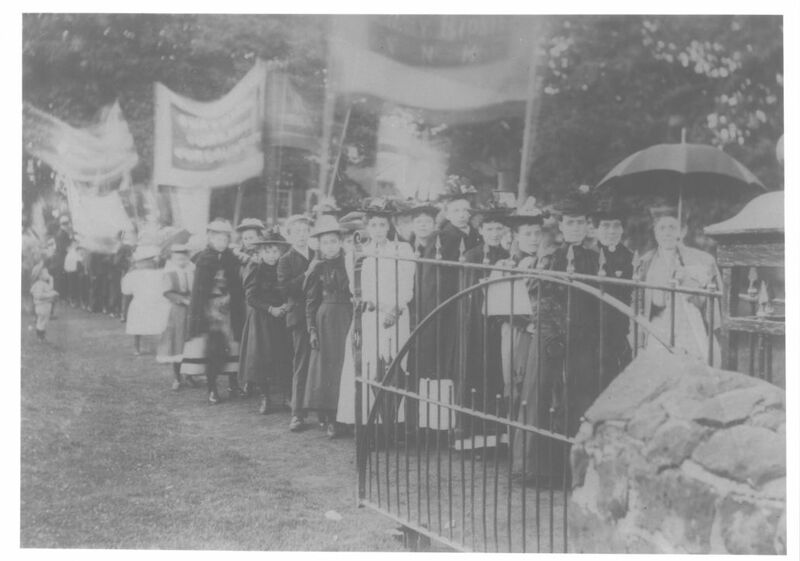 Dawley Demonstration Day, ‘The Demmon’ or later ‘Dawley Special Day’ as it was often referred to, was held each August Bank Holiday Monday, beginning in 1876. The original demonstrations were arranged for all the nonconformist denominations to participate in, a show of nonconformist strength in the area with its Wesleyan Methodists, Primitive Methodists, Methodist New Connexion, Congregationlists and Baptists. The inaugural event saw 16 Sunday Schools and 3073 children and their teachers represented, with the schools themselves being organised into 3 sections for marching to Dawley. These were Lawley Bank, Horsehay and Little Dawley. Each of the Sunday Schools would meet at their individual chapels, march under chapel banners to predetermined points, and then parade in their sections to Dawley, before assembling at Meadowell field in King Street. Children and teachers were then led in singing hymns, a vital part of nonconformism. The entire assembly would subsequently parade through Dawley, which was festooned with swags of evergreen and flowers suspended across the streets, whilst coloured flags were often waved from open windows. It was a festive occasion, with the parade being accompanied by brass bands – often including those from other parts of Shropshire and the Black Country - and led by men on horseback. As the Demonstration Day consolidated into a tradition, it began to attract thousands of people from the region, who lined the way and filled the approach roads, in order to cheer on the participants. The parade lasted more than an hour, winding its way up King Street, along High Street, round the Elephant & Castle, past Dawley Park, down Chapel Street, before returning to Meadowell field for further hymns and the National Anthem. The schools then returned to their chapels for tea, sports and prize-giving. In later years the event was enlarged to include all local Anglican churches, and when the Meadowell field became built on, the Council playing fields were used instead. Here speeches and sports often took place. The children always looked their best for the event with girls wearing their prettiest dresses, often white, and carrying baskets of flowers, whilst the boys wore their ‘Sunday best’. Dawley Demonstration Day lasted for almost a hundred years, the final occasion for its celebration being in 1971. • The original demonstrations were a show of nonconformist strength in the area with all chapels participating. • The event was celebrated for almost a hundred years, the final occasion for its celebration being in 1971.